(Reuters) - International Business Machines Corp forecast weak earnings for this year after reporting an 8.5 percent fall in fourth-quarter revenue as a strong dollar and tepid IT spending weigh on the Big Blue's results. Shares of the company, which receives more than half its revenue from markets outside the United States, fell 3 percent in extended trading on Tuesday. IBM forecast 2016 adjusted earnings of at least $13.50 per share, missing analysts' average estimate of $15 per share, according to Thomson Reuters I/B/E/S. The strong dollar shaved off $7 billion from IBM's 2015 revenue and reduced its profit by $300 million in the fourth quarter, Chief Financial Officer Martin Schroeter said in a conference call with journalists. Schroeter expects currency volatility to lower 2016 pretax profit by $1.3 billion. The dollar index, which rose over 9 percent last year, is expected to rise 3.4 percent this year. "I think tech investors are focused on how (CEO) Ginni Rometty could turn the ship around given the headwind that traditional tech companies are seeing in this environment," FBR Capital Markets analysts Daniel Ives told Reuters. IBM has been shifting away from hardware by selling low-margin businesses such as low-end servers and semiconductors to focus on high-growth areas such as security software and data analytics, besides cloud-based services. Yet the new businesses have so far failed to make up for revenue lost to divestitures. 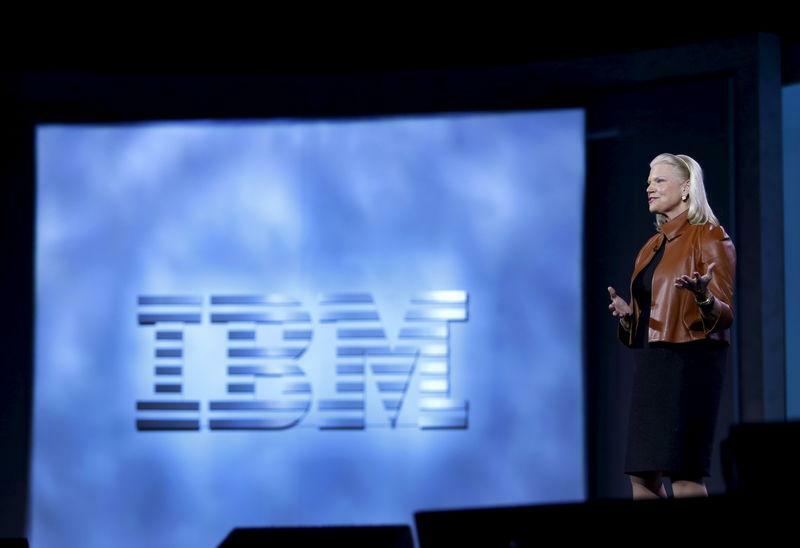 IBM's fourth-quarter revenue fell to $22.06 billion in the quarter ended Dec. 31. Analysts on average had estimated $22.02 billion. Revenue from "strategic imperatives", which include cloud and mobile computing, data analytics, social and security software, rose about 10 percent in the fourth quarter. "I think this was another challenging quarter for Big Blue as the company struggled to find growth in the evolving IT spending environment," Ives said. Total revenue adjusted for currency fell 2 percent. Net income fell to $4.46 billion, or $4.59 per share, from $5.48 billion, or $5.51 per share, a year earlier. Excluding items, the company earned $4.84 per share, beating analysts' average estimate of $4.81 per share. Up to Tuesday's close, IBM's shares had fallen 18.5 percent in the past 12 months.